Tip: How contrast can create crisp visuals. Sometimes we find some features that look OK but not great. Contrast can make them pop and give it the needed visual tension. 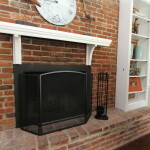 Our example is the brick wall with the fireplace and the mantel and shelves to both sides. 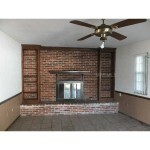 Everything was in a decent condition and we wanted to preserve the architectural features. So we decided to paint the wood elements white to stand out from the brick. 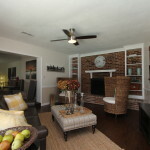 This was an inexpensive and quick transformation. The mantel was a bit skinny. So we beefed it up with trim and added some corbels to give it more interest and visual stability. The brown shelves did not stand out before we painted them white. Now they break the large brick wall up and give a crisp fresh look. The best design solution is often achieved when we can use what is there and enhance the existing features. This is a relatively quick and inexpensive way to bring out a nice focal point and showcase the build-ins that add extra value to the property.